Canoe Island French Camp (CIFC) provides summer fun with a French accent on a private island in the San Juan archipelago of Washington State. Everything from the location to the programs and facilities at CIFC is unique. Programming combines learning the French language and exploring Francophone cultures and the natural world with traditional camp activities. Over the years, many traditions such as campfires and off-island overnights have continued. New traditions have also begun, such as a session dedicated to learning about the French-speaking countries of the world, and an all-day camp voyage to neighboring Shaw Island. As with the program, facility projects over the years have kept true to many traditional concepts of the camp’s founder, Dr. Warren Austin, while new people and ideas have contributed to the legacy of this almost 50-year-old camp. Gordon Keith, in Voices from the Islands, published in 1982, asks why a successful California doctor would start a French-language camp on an island. The answer: It was a way in which the doctor and his wife could live on the land they had purchased and continue the French-language education of their daughter. In speaking with Laura Grove, a longtime camper, board member, and now supporter and archivist, I learned of her impression of the original facilities—built in the early 1970s—as a nice blend of comfortable and rustic. The main buildings of the camp, Maxim’s (dining hall, kitchen, bathrooms, and library) and the Ritz (offices, staff lounge, infirmary, and teaching kitchen) were both prefabricated homes shipped to the island and assembled with some customized additions, such as log poles from the surrounding area. The prefabricated-home option was useful, given the remote location of the camp and the need for all things to be shipped by barge to the island and assembled on site. In the mid-1980s, the Austins contracted the Seattle-based landscape architecture firm The Portico Group to design what they called Arkadia, which would resemble a French hamlet. Ideas ranged from a collection of stone huts to replace the tipis, to a stone water tower. The Austins wrote a check for $1 million, left for France, and asked The Portico Group to “surprise” them upon their return. 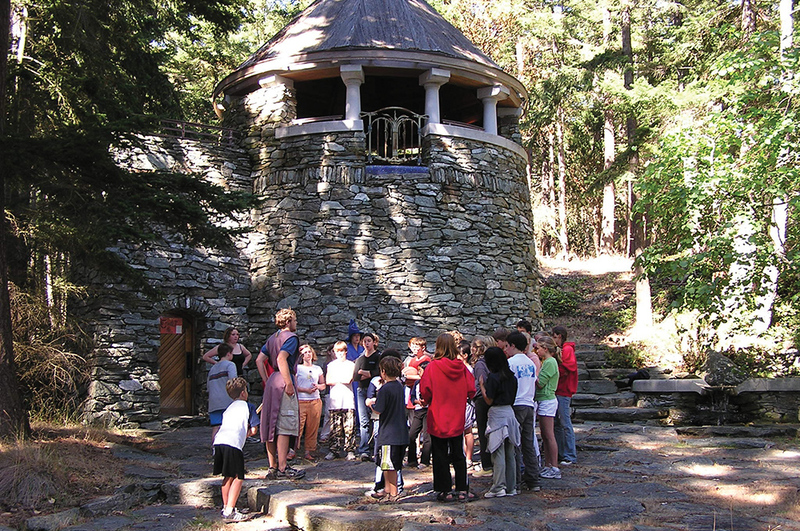 While not all of the original ideas for Arkadia were realized, Portico created what Grove calls “an incredible blend of purely functional and aesthetically gorgeous.” In speaking about the camp’s stone water tower, Grove notes, “The Colombier has to be the most beautiful water tower in the world.” Created to resemble a French windmill and dovecote, everything from the stone walls, the custom-forged iron gate, and the mosaic map of the San Juan Islands on the floor of the viewing tower to the classic cedar-paneled top leaves a lasting impression on anyone who sees it. It is for this reason that the Colombier has become a focal point for special-program moments. The knightly quest for the Holy Grail ends with King Arthur giving a speech to all of the camp from the top of the tower. A favorite evening activity, Egg Night, involves safely dropping each team’s egg from the top of the tower into a towel outstretched by campers below. Another stone structure created by Portico is the camp’s fire ring. It is a remarkable gathering place for campers to form friendships, sing songs, and make gooey s’mores. Even though the camp now operates as a non-profit and the founders have passed away, staying true to the aesthetics of beautiful stone, natural wood, and a feeling of being close to nature are always considered in the maintenance and renovation of the camp’s facilities. Longtime facility director and 2018 Executive Director Ben Straub aims for long-lasting renovations and a greener approach to facility construction on the island. Stonework stairs leading to the new tipi decks were installed when they were replaced in 2012. This kept with the vision crafted by the Austins and Portico. The camp recently purchased a sawmill, intending to use the wood harvested from the island for future projects. One of the upcoming projects includes the renovation of the camp’s art workshop. Designs for the new building reflect a simple Pacific Northwest approach for an integral program facility. After coming to camp for so many years, Grove feels that one element that makes Canoe Island French Camp great is the mix of architecture that has changed little over the years. Noriko Marshall, landscape architect and CIFC board member, believes that a successful facility needs a balance between unity and diversity. There can be a mixture of architectural designs as long as some concept unites all of the elements. For her, good design makes people thrive, be more joyful, and helps users in a way they might not fully understand. In this way, the importance of thoughtfully embarking on renovation and construction of camp facilities can have a lasting impact on how effectively the program achieves the camp’s mission. At CIFC, the facilities draw attention to the magnificence of the natural world and inspire curiosity for French culture and for communicating with one another. This furthers its mission of empowering campers to become their best selves and be caring, committed members of the San Juan Islands and the world. Sarah Stephens is the former program and marketing director at Canoe Island French Camp. Canoe Island French Camp encourages leadership, diplomacy, learning, cultural understanding, and stewardship of the environment with the goal of giving campers the tools they need to lead meaningful and successful lives resulting in positive impacts on their communities and the world.